The question of integration in the education of the ummah has been a top agenda among Islamic intellectuals and activists since the immediate postcolonial period, where secular humanism and atheistic modernism left Muslims with the legacy of a dichotomous education. Many contemporary Islamic educational institutions in the Muslim world have been established since then, each with their somewhat distinctive modes of integration. How much have the Muslims progressed towards true integration of the Qur’anic Worldview in the curricula of the natural sciences in secondary Islamic education, whose students are at critical stages of their cognitive, affective, spiritual, social, and ethical developments? This article presents a qualitative report on findings from field research that analysed a few samples of integration models at a number of Islamic secondary schools in Malaysia and Indonesia, in relation to the ideal that integration constitutes a full merger or an organic fusion between knowledge that is revealed and that which is acquired through reason. In an effort to understand Western modern science, this article briefly assesses the worldviews that have brought about the natural sciences to its current stage. 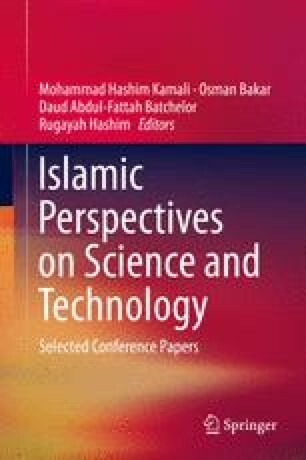 It proposes a model for Islamic secondary education where the natural sciences undergo a discreet but holistic reconstruction, reinterpretation, and redirection from the framework of, and organically infused with the Qur’anic Worldview, whilst enriching ‘Islamic studies’ with a good grounding in and appreciation of the natural sciences. Azyumardi Azra. (2011). Reforms in Islamic education: A global perspective seen from the Indonesian case. International conference on reforms in Islamic education, University of Cambridge. www.cis.cam.ac.uk. Accessed 7 Apr 2012. Encyclopaedia Britannica. http://www.britannica.com/EBchecked/topic/471865/positivism. Accessed 8 Oct 2010. Kutler, H. (2009). Private schools: Lessons in faith. Teacher magazine. 10466193, 20010301, 12(6), ERIC, via EBSCOhost. http://www.ebscohost. Accessed 1 June 2009. Mohammad, A. (2012, May 19). Program Ulul Albab. http://www.unitpimrsm.net/index.php/beritafokus/296-program-ulul-albab. Accessed 6 Oct 2015. Ministry of Education Malaysia. (1989). Kurikulum Bersepadu Sekolah Menengah (KBSM): The integrated curriculum of secondary school. Kuala Lumpur: The Curriculum Development Center. See also http://moe.gov.my/v/falsafah-pendidikan-kebangsaan. Accessed 8 May 2015. New World Encyclopedia. http://www.newworldencyclopedia.org/entry/Mechanism_(philosophy). Accessed 8 Oct 2014. Qutb, S. (n.d. a). In the shade of The Qur’an. Project Gutenberg. https://archive.org/details/InTheShadeOfTheQuranSayyidQutb. Accessed 10 Apr 2014. Qutb, S. (n.d. b). Islamic concept and its characteristics. http://www.islambasics.com/. Accessed 20 Jan 2014. Thorton, S. (2013). Karl Popper. http://plato.stanford.edu/entries/popper/. Accessed 1 July 2014. Vidal, C. (2008). Wat is een wereldbeeld? (What is a worldview?). In H. Van Belle, & V. J. Veken (Eds. ), Nieuwheid denken. De wetenschappen en bet creatieve aspet van de werkelijkheid. Leuven: Acco. “Secondary Education Division”. http://www.mara.gov.my/en/bah.-pendidikan-menengah. Accessed 6 Oct 2015.